The Guardian Easy Care Aluminum Commode offers unique features and high quality at an affordable cost. The 3-in-1 design allows for use as a raised toilet seat, bedside commode or toilet safety frame. The aluminum frame is lightweight and easy to transport. 3-in-1 design is an economical and versatile choice. Aluminum frame is lightweight and easy to transport. Full 19 inches between arms make Easy Care Commodes the easiest to use. Wide base depth provides more stability. Width Between Arms: 19 in. Guardian® products have a limited lifetime warranty against defects in materials and workmanship against with the exception of the folding cane, walker footpieces and hand-held shower kits, which are warranted for one year. This warranty does not extend to non-durable components such as but not limited to, rubber accessories and grips which are subject to normal wear and tear and replacement. In the event of a defect covered by this warranty, we will at our option repair or replace the product. 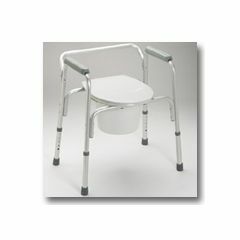 CAN YOU GET A PADDED REPLACEMENT SEAT FOR THE EASY CARE ALUMINUM COMMODE. I have a Easy Care Aluminum Commode. It's never been used &amp; I asked my husband to bring it in so I can use the frame for safety. One of the extension legs is missing. Can we have one sent to us and, if so, what is the cost?